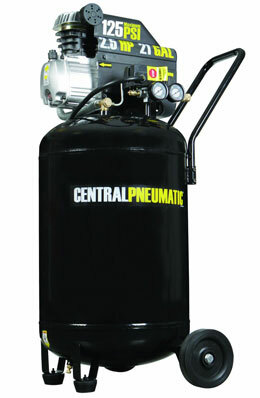 One of CP’s best selling models has to be the 21-gallon, 2.5 horsepower, vertical compressor. This compressor was recently reviewed by Street Trucks Magazine who wrote this about model 61454: “The perfect compressor with powerful, quiet, and consistent airlow”. As with other models by this company, price is a major factor since most DIYers simply don’t have the $600 or so dollars to spend on a leading brand. For around $200 (or less if on sale), you can have a decently powerful compressor with a large tank for continuous operation. The 2.5 HP motor pushes out 4.7 CFM at 90PSI with a maximum working PSI of 125 which is pretty standard. This long-life oil-lubricated compressor needs only minor maintenance and even has an oil level indicator to make things easy. Large 6-inch wheels and handle make moving it easy although most folks will simply leave it in the corner of their garage. Unlike other brands which will remain nameless, the Central Pneumatic starts up in the wintertime without issue. Probably the biggest downside is the noise. This is where many higher priced models have the advantage. The CP 61454 is rated at about 90 dBA which makes it on the loud side of the scale. That said, I’ve been around louder models made by Campbell Hausfeld and even Porter Cable. No matter what compressor you end up buying, it’s always recommended to wear ear plugs. With the air output this model provides, you can use almost all air tools except for maybe some air sanders or heavy duty impact wrenches. I personally own this compressor and use it in my woodshop. One thing I want to mention is the importance of properly breaking it in once you get it. Also, I believe it’s quite beneficial to change the oil after the first 30 minutes of use as well as use a quality paper air filter. Take good care of it and it will last you many years. Overall, the Central Pneumatic 61454 air compressor is one of the best values out there. While not everybody may need a 21-gallon tank, the price is almost too good to pass up. If you have the room in your shop or garage (its footprint is actually fairly small), consider this model to get some good bang for the buck. I currently own a 61454 21 gallon air compressor. I really like its performance and have absolutely no complaints about it. I do, however, have a small problem. I was using my compressor today when it suddenly lost air pressure. When I went to look at it, oil was spewing out of where the filler cap should have been. somehow the cap came off, exploded off, and I cannot find it anywhere. Do you sell the replacement filler caps and if so where can I get one or two?